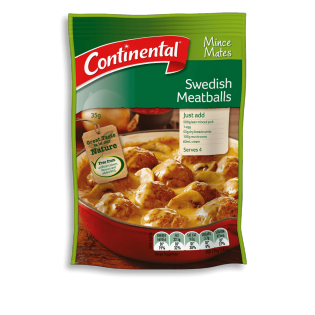 Continental's Swedish meatball recipe base is made with a tasty rich creamy sauce, that is perfect for any occasion. Learn how to create this dish here. This was a family favourite and quite shocked to find its been discontinued. Please bring this back!!! Please bring sWedish meatballs back!!! Its one of the only dinners that i know my son will eat. FuSsy bugger he is. Thanks for the lovely feedback & we will most certainly pass this along to the right people for some thought. Absolutely delicious and so easy to make!!! I just wish my 3 nearest woolworths and coles wOuld stock them. Thanks Belle! This has actually been delisted from our range which is why you are having trouble finding it. My son said this was the best meal ever over tortillas hehe, its the family weekly FAVORITE. Its quick easy and delicious......bring it back to the shops please. I am THE most fussiest eater and to have finally found something i absolutely love to then realise its no lonGer being stocked is so disheartening.. please bring it back ! Ive had Swedish Meatballs once a week for what feels like ever! I jUst ran out of recipe bases and went to go buy more .... Imagine my horror when i realise its been discontinued !! What is this sorcery BRING IT BACK !!!! I cant live life without it. We hear you & so will our Marketing team. We have been using this product for many years, fantastic product. Up until just recently we could still purchase at WOOLWORTH'S. Most of this range has left the shelves, it is also great as a camping meal. So DISAPPOINTED. Hi Carl, product deletions are often due to poor sales or to make way for new products & sadly this was one of them that had to go. We'll definitely pass your feedback to the team. Lovely to hear that you are a fan of our Swedish Meatballs Recipe Base but this has been deleted from the range due to poor sales & low distribution. Sorry about that.